One of the newest advances in cooking is to add a steaming function to a convection style countertop oven. The convection aspect already means that you’ll be able to cook foods much faster and more evenly than a standard toaster over, but when the steam function is employed, you’ll not only to be able to steam foods, like veggies and such just like in a regular steamer, but you can also use the steam as a cleaning agent too. Simply turn the steam function to “super steam,” in an empty oven, let it saturate the inside with hot steam and wipe it clean! You can also use it to proof first and then bake your own bread. Some of the functions can be used in combination with others. It’s a neat appliance all the way around. Get the Cuisinart Steam & Convection Oven CSO-300N1 on Amazon. Obviously, the Cusinart is not made to replace a full sized stove oven, but it can do many of the things you would use one for and it fits on your countertop. Of course, it works well in any kitchen, but this would be an ideal appliance for a college dorm room, a vacation residence and even an RV. Not only that, it uses less power and cooks faster than full size, and the steaming function almost replaces the abilities of the top stove elements too. Something that may be overlooked is the fact that it will actually save energy on your electric bill. The Cuisinart uses about half the energy that a full sized oven uses, and far less if you are using both the stove and the oven at the same time, and it cooks faster too. That means less time running and less time cooking, and if you use it on a regular basis, your overall electrical power consumption and your energy bill, will go down. 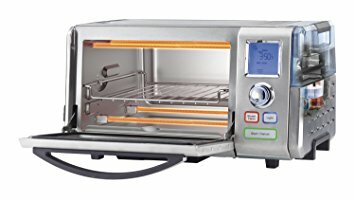 It can do everything that a convection toaster oven is supposed to do, like baking, broiling and toasting, but it goes one up and has a setting for steaming, a setting for proofing of dough, and a super steam setting for cleaning the insides when it is empty. You can also combine Bake and Broil with the Steam function so that you get a nice golden brown top on your chicken or cake while the inside is nice and juicy or moist. Reheating leftovers won’t result in dried up food. You can only use 25 degree F increments when setting temperatures for the bake/broil settings and 10F increments on the steam setting. For those cooks that insist on being able to set more precise temperatures, you’ll have to look elsewhere. For other toaster ovens, check out our top picks here. Essentially it works like any other compact oven but with a few twists. The completely digital interface and LCD screen make programming and checking on the progress of your meal a snap. Just select one of the presets using the dial for the type of cooking you want to do. For example, there is a bread cooking pre-set, a convection oven pre-set, and a steaming button preset among others, and it shows a default cooking time which can be adjusted by you. Then place the food inside and let it cook. When done, the oven will turn off and you can remove the food. Although it is actually easy to use, read over the instruction manual first before cooking anything to give you an idea of how it works and what to expect, especially with the convection and steaming functions. Convection bake, Bake Steam, Broil, Bread, Toast, Steam Broil and Super Steam are the available cooking operations. It can steam for up to 120 minutes at a time. The basic cooking and convection oven features are easy to use, understand and access. But the steamer use may take a little getting used to, so it is better to try steaming a few things first as a test before actually attempting to make a meal. The instruction manual can be a valuable tool for this oven, so it should at least be looked at just to familiarize yourself with the functions of the oven. Can only adjust temperatures by 25 degrees F for bake and broil an 10 degrees for steam. The Cuisinart may not be able to replace your regular oven when it comes to making elaborate meals but it has the potential to come close. You would need two of them to do that; one to steam veggies while the other cooks up a roast. Granted, it might be considered a toaster oven, and you can make toast very well on the center rack, but if that’s all you want to do, then use your regular toaster instead. This is a very versatile and usable appliance that under the right conditions could become the centerpiece of your counter space. But regardless of anything else, it will make your food taste great even while keeping calories down with the use of less oil, and if that’s what your priorities are, you will be pleasantly surprised using it. If you like what you see then head on over to Amazon to buy the Cuisinart Steam and Convection Oven now!